Intimidation Clothing is pleased to announce yet another addition to the company’s long list of support of female fighters with the creation of the Katy “Red Dragon” Collins signature tee. A long-time supporter of Women’s MMA, Intimidation sponsored Collins as an amateur and she will become the 4th professional female MMA fighter with brand to have her own custom signature tee style. A product of the Branson Fight Club, her pro debut is set to take place on May 9th in Branson, Missouri. Collins completed a 7-3 amateur MMA career in March 2014 with a successful title defense of her ShoFIGHT amateur belt . The win marked her 5th straight victory to close her army career as she competed seven times for the popular Missouri-based ShoFIGHT promotion. Collins was also the Brawl Inc. Women’s Amateur Flyweight Champion and she was ranked in the Top 5 Amateur Flyweights by several sources. With a custom signature shirt design of her own, Collins joins UFC Bantamweights Jessica “Evil” Eye and Jessamyn “The Gun” Duke as well as fast-rising Strawweight Rebecca “The Professor” Heintzman on the Intimidation signature tee roster. The Intimidation brand has claimed to be one of the biggest supporters of local MMA in the USA for years and the company’s strong footprint in the Midwest was further cemented over the weekend. Sponsoring events and fighters in Indiana, Missouri and Pennsylvania, Intimidation’s name continues to grow in the Midwest and surrounding states as the company’s expansion efforts become bigger and bigger. As it has with each event, Intimidation sponsored the most recent Midwest Fight Series event over the weekend in Indianapolis. Owned in part by UFC veteran Chris Lytle, the organization has become one of the fastest-growing in the Midwest. The Intimidation Clothing booth was hopping all night, and Intimidation sponsored pro fighter Bryant Whitaker picked up his second win with a first round guillotine choke over Joel Miller. Intimidation also sponsored the ShoFIGHT organization for a second time, as the organization held an event in Branson, Missouri. 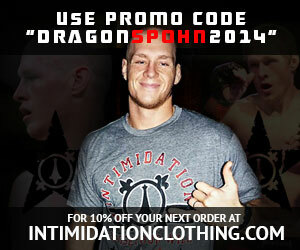 Intimidation continues to make waves in the Show-Me State, sponsoring multiple events and upcoming fighters. The Steel City also featured an Intimidation sponsored event, as Gladiators of the Cage took place on the North Shore of Pittsburgh over the weekend. While Pennsylvania may not be considered the Midwest, the Intimidation brand has long been one of the biggest supporters of the growth of MMA in and around Western PA. Intimidation Clothing is a fast-growing brand of lifestyle apparel & MMA training gear with a growing national presence and over 50 authorized dealers across the USA. The Intimidation brand is regularly featured on multiple sporting events on SpikeTV, AXS TV, FOX SportsTime Ohio, MTV2, FUEL TV, The Comcast Network, Comcast SportsNet and EpixHD as well as MMA highlight shows on Spike TV, AXS TV and more. In addition to over 110 styles of high-quality, bold t-shirts and sweatshirts for men, women and children and is also known for their premium-quality EliteFighter MMA board shorts. Anyone interested can become a dealer by applying to sell the Intimidation brand which is also available for sale online at IntimidationClothing.com. Fans can also follow the marketing wing of the Intimidation brand, Intimidation Interactive Media, @IntimidationIM, like Intimidation Clothing on Facebook or follow @IntimidationMMA on Twitter. Intimidation Clothing is pleased to announce its continued sponsorship of the Missouri-based ShoFIGHT organization, as “Summersmash” is set to take place on July 20th in Branson, Missouri. This outdoor event is set to feature some of the best up and coming fighters in the area. The event’s main card will be aired live via iPPV on GoFightLive.tv. In the main event, the ShoFIGHT Lightweight Championship will be on the line as Matt Rosa defends his title against Mike Breeden. The Women’s Featherweight Championship will also be on the line as Brittany Douglas faces Courtney Stowe. This will be the second ShoFIGHT event sponsored by Intimidation Clothing, as ShoFIGHT XXVI was also sponsored in April. Intimidation has recently expanded its reach in Missouri, including sponsoring rising lightweight Eric Irvin as well as the MMA Sport Federation organization in St. Louis. Not a weekend goes by when the Intimidation Clothing brand isn’t being represented somewhere across the U.S., a testament to the size of the fastest growing clothing brand in mixed martial arts. This past weekend was no different, as Intimidation sponsored three events in two different states and Intimidation sponsored fighters went 6-2 in fights that took place in three different states. As always, Intimidation was a title sponsor for the NAAFS: Combat Challenge 24 event, which took place on Saturday night in Akron. Intimidation fighters from the GriffonRawl Academy went 2-1 on the night, including a win by Joe Callari in one of the evening’s featured bouts. Josh Belle was also welcomed to the official GR fight team with a submission win in his debut. Evolve MMA’s Jon Looft along with Strong Style’s JT Miller and Mad Dog Fight Team members Tony Bonacci and Chris Varner also picked up wins at the event. Intimidation also sponsored the ShoFIGHT event in Branson, Missouri, which was one of the nation’s biggest MMA events, as it took place during a block party in the popular destination town. Intimidation sponsored fighters from Ronin Training Center went 3-0 at the Absolute Action MMA event in Florence, Kentucky, as Derek Morgan, Jamie Klein, and Vanessa Demoupoulos all earned victories at the event. Intimidation sponsored pro Luke Zachrich was also in attendance to promote his upcoming UVC 23 main event against Marcus Finch in Columbus, and the two were involved in a shoving match during their square off in the cage. Intimidation sponsored fighters also went 1-1 at the inaugural Hilia Fights event in Louisiana, which was shown on Fight Now TV. MTV “Caged” star Tony Kelley picked up yet another win, moving his professional record to 2-0. Sammy Smith Jr. was unable to pull off the win in the main event, as he dropped a heavyweight title fight to unbeaten opponent Chaz Morgan. This weekend, Intimidation will serve as a title sponsor for the Rocktagon 25 event in Cleveland, Ohio. Intimidation Clothing is pleased to announce its sponsorship of the upcoming ShoFight XXVI event on April 27 in Branson, Missouri. The event, the organization’s annual outdoor MMA show, also features a block party at Branson’s Outback Pub. The event is one of the organization’s feature events of the year, and includes some of the Midwest’s top fighters. Included on the card is ShoFight middleweight champion Rance Foust, ShoFight champion Daniel “Pitbull” Blair, “The Ultimate Fighter” veteran Dakota Cochrane, and more. ShoFight has been named the ‘top MMA organization in the Midwest,” and has featured fighters from top gyms like Xtreme Couture, Team Quest, Jackson’s MMA, and more. Intimidation Clothing is pleased to be featured as a presenting sponsor for ShoFight for the first time, continuing the company’s expansion in the Midwest and across the country. Intimidation is also a sponsor of other top regional MMA promotions in the Midwest including the NAAFS, XFO, UVC, Colosseum Combat and more.